Comar, which means "meeting place of the waters" was the name given by the ancients to a settlement at the northwest corner of Strangford Lough at the confluence of the Enler and Glen Rivers. Today we call it Comber, famous for its spuds. 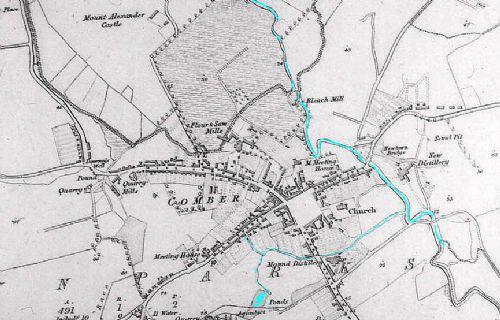 The earliest 6" Ordnance Survey map of Comber dates back to 1834 (shown below). The town was a much smaller place then, and we see green fields where later on housing estates woudl be built on Darragh Road, Copelands/Dermott estates, Glen Road, etc. In 1831 the population was only 1377, nowadats it is a little over 9000.There were 355 houses in 1837. The street pattern is already familiar, with 4 streets leading into the Square at the centre. Darragh House takes it's name from the road/area the school was buit in.